***Please note, pictures are for illustration purposes only, this item comes in Zinc steel. 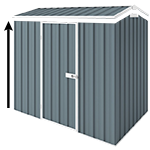 The Storemate 43 ZINC is 1.41m x 1.07m and 1.265 high. What wind rating is your Storemate please? Thank you for the question. The StoreMate does not actually classify as a garden shed and don't have a wind rating. They don’t require engineering either. They are not recommended for cyclonic areas.